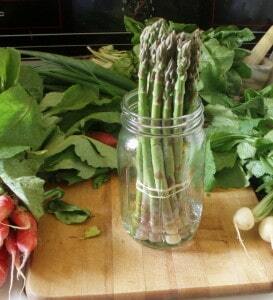 As I said, now, at the end of May, we are finally seeing Spring vegetables! 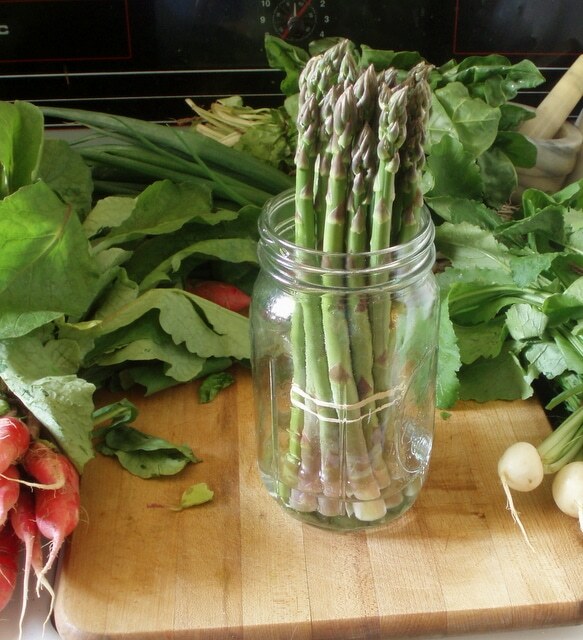 I went to Greenmarket last week, and brought home baby chard, and scallions, and radishes – and asparagus. 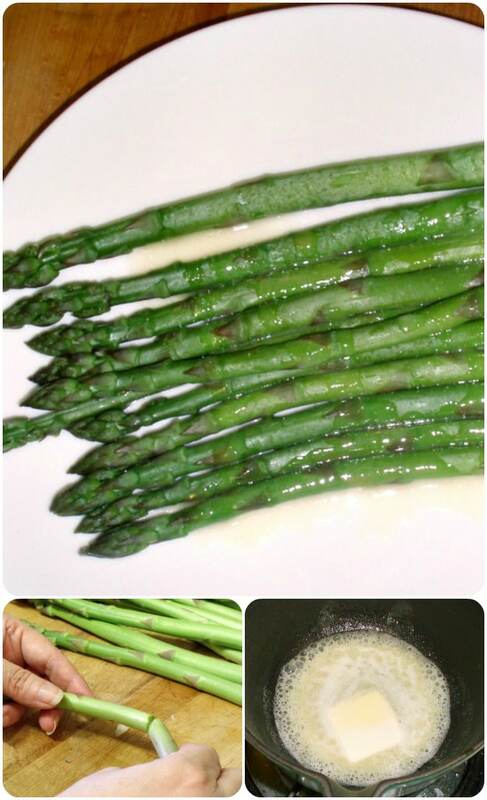 Asparagus is such a treat – a delicacy that comes in early, doesn’t really last long, and doesn’t really store well. It’s a perennial, so a farmer needs to dedicate space to it – no growing something else when the season is over, as efficient farmers (and gardeners) do with other crops. They have to let the (lovely, lacy) asparagus fern grow, and die back, so the plant will set spears again next year. For these reasons, it is also more expensive than many other vegetables. At Greenmarket, farmers sell it by the bunch, with bunches standing up in water to keep it fresh. 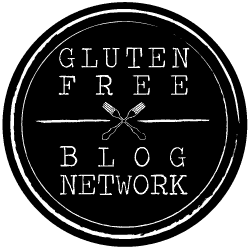 Once the ends are cut, they start drying out – most supermarket asparagus have a long woody bit at the end that you don’t want to eat – but this helps prevent that. When I got it home, I put it right into a jar of water to keep it fresh – and then ate it that night. 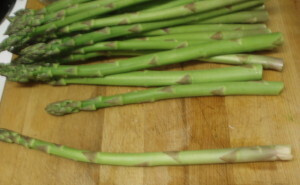 Even this asparagus had a few woody ends, so I could show you how to deal with them. (You can see the whitish end… that has dried. The others are green all the way down.) 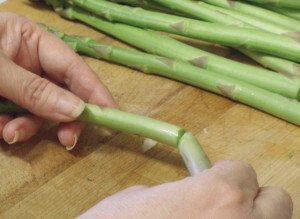 The trick is to snap it, rather than cutting it, as it will snap just where the stalk becomes tender. 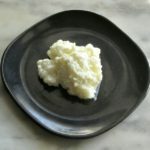 If you cut, you are guessing – and may either waste a lot or get fibery tough bits on your plate. 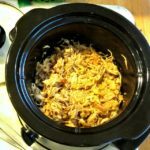 You’ll need to do this with all the stalks bought from the supermarket – or even bought from a farmer who didn’t keep it in water, or if you didn’t then keep it in water yourself. 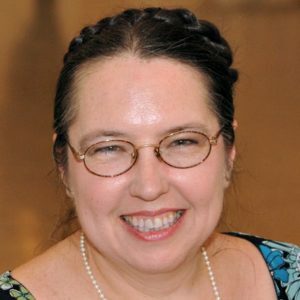 (I didn’t know to do that, originally – years ago, I bought it from a farmer I knew upstate who went back and cut it fresh for me – but since I didn’t know to put it in water, the ends had still dried by dinner time, though less than I was used to.) In this case, I tested the ends with a sharp knife – if there was resistance, I snapped them; if it was tender, I just sliced off the very tip. Then the trick is cooking the long spears. Sometimes I just simmer them in a frying pan. I prefer them steamed, though. I have one of those folding steamer inserts, made to fit in pans of various sizes. I don’t usually use it in a saucepan, as I have another steamer, made to fit in saucepans, but it’s wonderful when I need a wider surface. 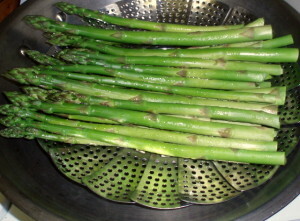 This time, I set it in a wok that has a good lid, put water in the base of the pan, and spread the asparagus spears out. Then I covered the pot, brought it to a boil, and lowered the flame so the water would simmer, and steamed it. It generally takes between 5 and 10 minutes to cook. It varies by the freshness and tenderness of the spears, by their size, and, of course, by your own preferences. 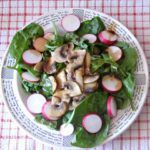 I gave these about 5 minutes, as they were very fresh and I prefer light cooking of vegetables, then checked with the tip of a sharp knife – they were completely tender, so I served them at once. This being the first asparagus of the season, I served it as a course by itself – a classic service. I also decided to gild the lily with a lemon butter sauce… I put the juice of one lemon in a small saucepan, and brought it to a boil. I let it boil down a bit, to reduce it by about half. 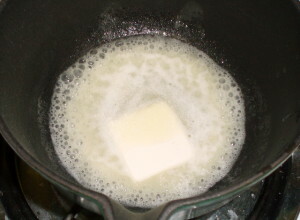 Then I put butter in, one pat at a time, and stirred after each addition, to make it creamy. About 4 teaspoons, all together. The butter and juice meld into a wonderful creamy sauce, which I often make for artichokes. Proportions vary a bit – this was very lemony… I liked it, but Rich thought it a bit sharp. 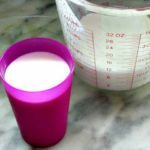 Next time, I might start with half the juice, since I didn’t want too much butter for just two servings – or I might go ahead with this, add more butter, and save some for other use. 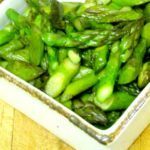 I’ve made this often, so it didn’t take much attention, and I made it while the asparagus steamed… but it might make sense to make it before starting to cook the asparagus – it will hold for a few minutes better than the cooked vegetable. Juice lemon. 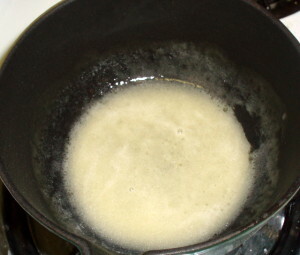 Put the juice in a small heavy saucepan, bring to a boil, and reduce by half. 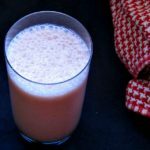 Once it is reduced, add butter, a little at a time, stirring well after each addition, so that it melds into a creamy sauce. The amount you need will vary by the size of your lemon and how tangy you like the sauce. Keep sauce warm over low heat. 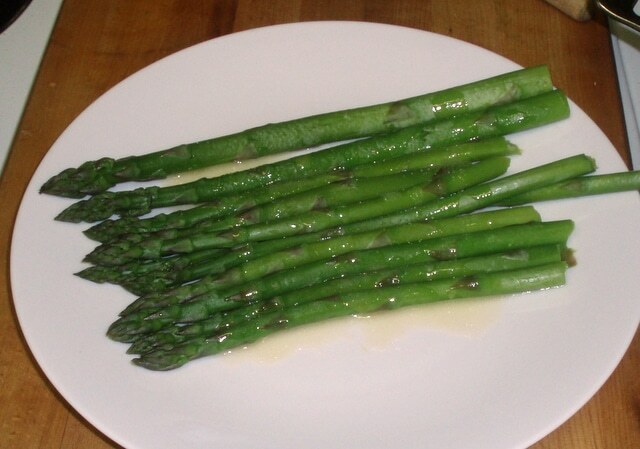 Steam asparagus 5-10 minutes, until tender and done to your taste. Timing will vary by the size and freshness of the spears, as well as your taste. Either pour sauce over the spears when you plate them, or pass it on the side. 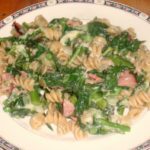 I usually make the sauce while the asparagus steams, but if that is not practical for you, the sauce holds better than the cooked vegetable. Yummy! Asparagus is such a treat. Lemony butter sauce sounds like a perfect accompaniment. Would you believe that here in Brazil now for a little over a year and have never seen asparagus to purchase (not even one time---celery either)? 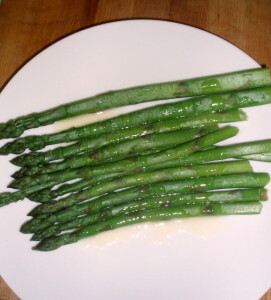 I really miss asparagus. But the tropical fruits here are amazing and fabulous (like mango and passion fruit) I guess it is a bit of a trade-off:) But when we come back, I will give your lemony sauce a try A.S.A.P. Hope you have a great weekend! How interesting! It is a perennial - I wonder if it needs the cold weather to go dormant before it grows, again. I know that's the isssue with a lot of fruit trees, for instance - if there's no frost, they won't flower. Well - enjoy your tropicals while you have them... and thanks! You have a good weekend, too. 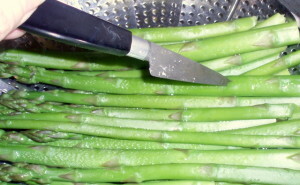 I admit that I generally nuke my asparagus because it makes fewer dishes to wash. ;> Just throw the stalks into a microwave-safe dish (a glass breadpan is exactly the right size for a pound or so), make sure there's a little water in the bottom, cover, and zap until you can smell it. 8 minutes is about right in my ancient 650 watt microwave; 5 is plenty in modern machines. Mama used to make blender hollandaise when she wanted to spiff up asparagus, but I'll try to remember now how simple it is to make lemon butter. I don't tend to talk about microwave cooking here, because it is so hard to give timings that are at all accurate - there's so much variation by oven. But I must say, the idea of doing it in the breadpan - just the right size and shape!- makes it tempting... Hollandaise is lovely, and not too compliated in the blender, but sometimes you just need easy. Oh, I might try the vinaigrette, sometime. I like having variations... Thank you!